Two years back, after Zach Britton emerged as an effective closer for the Orioles, he drew a lot of attention for his sinker. At the time, I used PITCHf/x information to try to find some similar sinkers. For the most part it was a forgettable post — most of these are forgettable posts — but there was one thing that stuck with me. One name I haven’t been able to wipe from my mind. It’s even more interesting now, with Britton having graduated into the class of the elites. You might not yet recognize Britton as an elite reliever, but he for sure most recently was an elite reliever, again driven almost exclusively by his fastball, which he threw 90% of the time. Compared to the year before, Britton generated way more strikeouts. Compared to the year before, Britton trimmed his number of walks. And compared to the year before, Britton somehow increased his grounder rate, which was already absurd. You look at what Britton did, and you see that he did it mostly with one pitch, and you realize, hey, that’s one hell of a pitch. 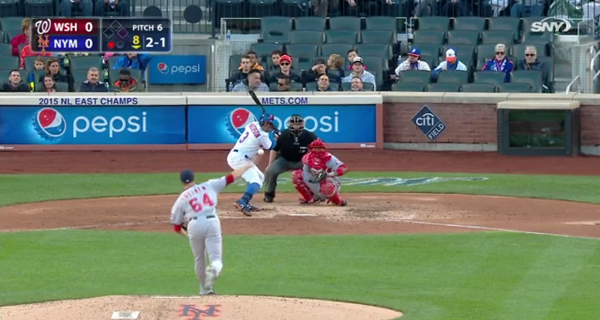 Wouldn’t you be interested in knowing there’s someone out there who throws an almost identical pitch? It’s time to get to know Blake Treinen. Blake Treinen pitches for the Nationals, and Blake Treinen throws the Zach Britton sinker. The second one seems like a big deal, but maybe it shouldn’t be — Britton attacks lefties and righties with his sinker, and Treinen, in theory, could do the same, and all they have to deal with are reversed splits. I don’t think the handedness is important. As for the first one, yeah. That’s why you definitely know who Zach Britton is, but many of you probably didn’t know who Blake Treinen is. Treinen throws the Britton sinker. He just hasn’t yet thrown it as well. But the qualities are alike. In terms of how the pitches actually behave, they’re brothers. Or maybe they’re more like fraternal twins, given that one’s a righty and one’s a lefty. I grabbed information from the Baseball Prospectus PITCHf/x leaderboards for 2015. Eyeballing sinkers, both Britton and Treinen averaged 97.1 miles per hour. Where Britton got about nine inches of horizontal movement, Treinen got about 10. And their vertical movements differed by just two-tenths of one inch. Applying my pitch-comp formula confirmed what was already obvious. The two make a wonderful match. Only a few handfuls of sinkers in the league were thrown at least 97, and of those, Britton and Treinen are most similar by movement. Treinen has two inches on Britton, but Treinen’s arm slot is a little lower, so the ball comes out at almost the same exact place. Sam Dyson, for the sake of comparison, also has an excellent sinker, but the ball comes out of his hand a lot lower, and it ends up with more drop. Dyson sort of throws the Britton sinker, and Dyson just had a breakthrough campaign with the Rangers when he learned to lean on the sinker more. But Treinen’s sinker is the better match. It’s a wonderful pitch. It’s a beautiful pitch. It’s a pitch we already know, from the Britton example, can work when thrown well and when thrown almost exclusively. And yet Blake Treinen isn’t as good as Zach Britton is. He’s been fine, especially against righties, but Treinen isn’t yet considered reliable. The following heat maps indicate why. 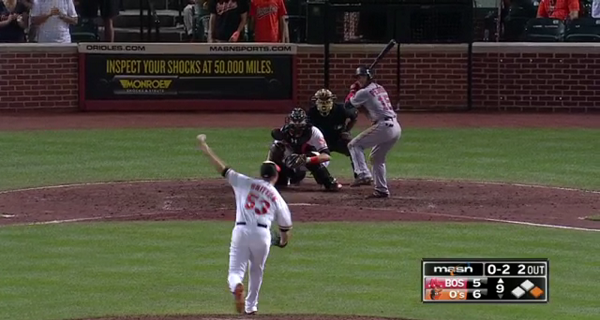 Visually, it appears Britton did a better job of keeping the sinker down. The numbers back that impression up. The average Zach Britton sinker wound up more than six inches lower than the average Blake Treinen sinker. That’s the difference between the knee cap and mid-shin. For an alternate view, draw a line at the top of the lower third of the strike zone. Britton threw 68% of his sinkers below that line. Treinen came in at 47%. Just as it’s critical to keep a rising fastball up, you have to keep sinkers down, or else they become far less effective. Britton kept his sinker down better than just about anyone else. Treinen still has some learning left to do. Maybe you’re left thinking this is kind of silly — we’re left with a difference in command, and Treinen is just one of countless live-armed pitchers who could stand to improve their command a level or two. The bulk of them never do it, and Treinen might not ever do it, but what this should be is a demonstration of Treinen’s upside, if he just gets a better handle on his bread-and-butter pitch. He has other pitches, and his breaking ball is similar to Britton’s, but the key is the sinker, and if Treinen can locate that sinker down with more regularity, it seems he could get away with throwing it an awful lot. As a reliever, he doesn’t need to mess around with his four-seamer. He just needs to keep his sinker low. If he can hang around the knees, instead of mid-thigh, Treinen could turn into something special. It’s not like Britton himself was an immediate success. Given how good he was last year, Britton’s sinker was sort of like Mariano Rivera’s cutter. You wouldn’t call someone the next Mariano Rivera just because he also throws a cutter. And Blake Treinen isn’t necessarily the next Zach Britton. He just could be, and he could be real soon, because he’s already got the stuff, and it could be about making the simplest of tweaks. 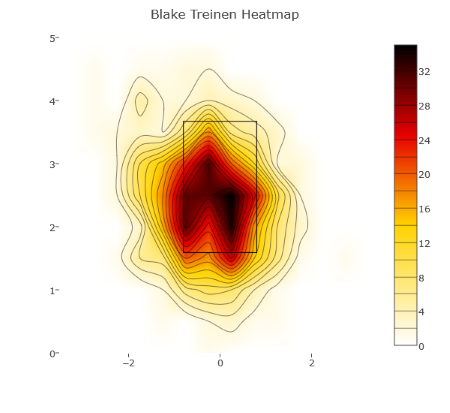 Because of pitch comps and PITCHf/x data, I’m greatly intrigued by Blake Treinen. It’s not often you can so easily observe a player’s ceiling somewhere else in the league. We hoped you liked reading Waiting On the Next Zach Britton by Jeff Sullivan! What’s this…..optimism? About the Nationals bullpen? Well I’ll be!